The University of Mississippi Department of Music offers a unique opportunity to experience Eric Whitacre’s music as he conducts the University of Mississippi Concert Singers, Men’s Glee, Women’s Glee, University Chorus, and Symphonic Band in cooperation with rehearsal conductors Bill DeJournett, Debra Spurgeon, and Donald Trott. 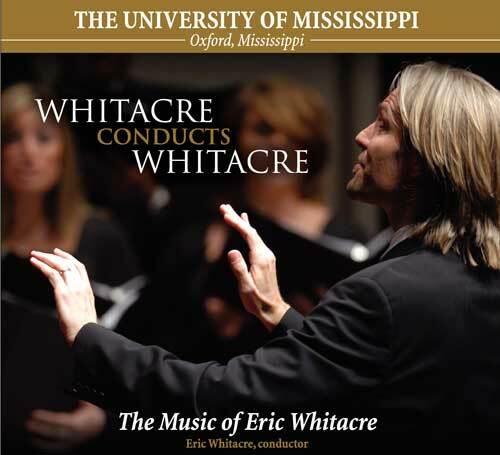 This project was the result of a two-day campus visit in April 2007 with Eric Whitacre including rehearsal time, a recording session, Q&A with students, and culminating in a concert for the public. This recording is a mixture of live and recording session performances.